• They give you light on two sides of a structure, and even on a cloudy day there is usually a light and a dark side of building, whereas a facade is almost always bathed in the same light unless there are cast shadows. 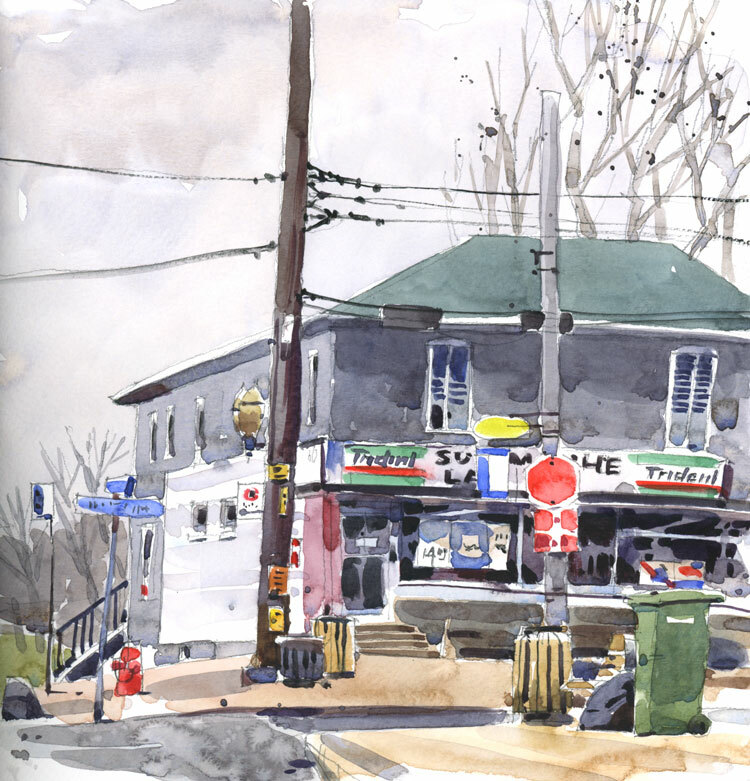 Here are some other corners I like sketching: Corner of Sixth, Corner of 9th, Corner of Ste. Marie. It gives a very pleasing 2:1 composition. There is something about seeing the view around the other side that gives such charm to this sketche…and I checked out the others that you posted too. Lovely piece! Thanks for being such an excellent teacher! Bernadette, I am still a student! Your blog is a breath of fresh air and i always either learn something brand new or come away with new perspective (no pun intended). You always do such a great job depicting signs without being too detailed. And the colors in the sky are beautiful! Gray skies are all we’ve been seeing in Portland for months on end it seems! I can’t echo that thought enough Linda. I am ready for spring. Today we had another cold blast of winter wind and snow. Ugh. I am waiting for those bulbs I planted last fall to pop through the ground. I really enjoy the notes with your blog. You always have a little gem or tip to share. Thank you. You take the ordinary and turn it into a treasure. I enjoy both your corners and your facades. They often remind me of the city neighborhoods I grew up in. I think the small bits of shapes and color are fascinating. The reds draw one’s eye around. It was your class on sketching and painting the city that got me back into painting and I will forever be grateful.